Working in academia can pose challenges for faculty who frequently move to unfamiliar places to secure lucrative positions. Fortunately for Dr. Christopher Ryder, University of Mary Washington's newest Director of Choral Activities, the connections that often take years to establish are rooted deeply in his personal history. also a real advantage to mixing singers from different age groups because each group has its vocal advantages, and with a mixed group you can showcase those advantages to great effect." All three UMW Choirs, including more than a hundred singers from the University and the Fredericksburg community, will showcase their diverse voices this month in a special concert titled I Dream A World - Poetry in Song which will feature poetry set to musical compositions. It will take place at 7 p.m. on Sunday, April 14 at Fredericksburg Baptist Church. They will be accompanied by Karlee Thomson for Fredericksburg Singers and Cathy Hoskins for the UMW student choirs. Ryder describes this unique performance: "April is National Poetry Month, so we're celebrating with music and verse. It's a good pairing because poems offer rich text, and if you get a composer who knows how voices work, they can bring it all together. We have seventeen pieces by different composers in the concert paired with verse that is all over the map - everything from Shakespeare to Edgar Allan Poe." Ryder invites the community to participate in the Fredericksburg Singers and the Fredericksburg Community Chorus, which is celebrating its 50th Anniversary this year by performing the entirety of Handel's Messiah for their concert in December 2019. He encourages all those who are interested to contact him atcryder@umw.edu or at 540-6541960. 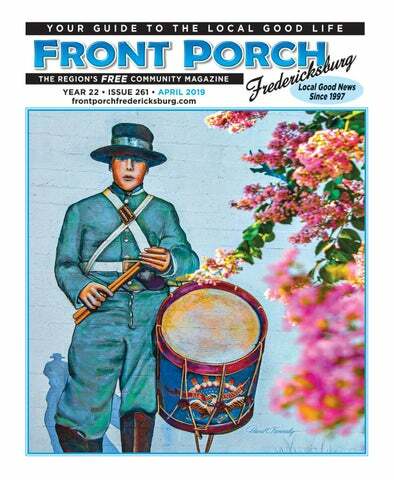 Front Porch Fredericksburg is a free circulation magazine published monthly by Olde Towne Publishing Co. Virginia Bigenwald Grogan, Publisher. The mission of Front Porch Fredericksburg is to connect the diverse citizenry of Fredericksburg with lively features and informative columns of interest to our community’s greatest resource, its people. Messages from our readers are welcome. All submissions must be received by e-mail by the 19th of the month preceding publication. Writers / Artists / Photographers are welcome to request Guidelines and query the Publisher by e-mail. Front Porch Fredericksburg PO Box 9203 Fredericksburg, VA 22403 Ad Sales: E-Mail: frntprch@aol.com Web Site: www.frontporchfredericksburg.com Facebook: @Front Porch Fredericksburg The opinions expressed in Front Porch Fredericksburg are those of the contributing writers and do not necessarily reflect the opinion of Front Porch Fredericksburg or its advertisers. Copyright 2019 Olde Towne Publishing Co. All rights reserved. added to the mix. Thanks to the everexpanding trails network, Fredericksburg's walkability continues to improve, and with it more and more residences are conveniently connected to the central core. That, I am confident, will continue to draw people to our 10.4 square miles nestled in between two rapidly growing cities. And that is why my family will continue to appreciate the home we have to return to at the conclusion of what I hope to be many great adventures to come. Bill Freehling is Fredericksburg's director of economic development and tourism. He lives in downtown Fredericksburg with his wife, two children and small dog. He has been reading The Front Porch cover to cover for 15 years. photo by Brian Will “Hepatica” special effort to check for it as soon as plants begin emerging since it only takes about two days once the bud is formed for it to have flowered and set seed, often disappearing completely a few days later. The Twinleaf seed heads, though, are quite ornamental; they look like a lamppost to me, and also resemble a chrysalis. The seed head cap opens like a hinged lid when the capsule is ripe to release the seeds. Spring also heralds the reappearance of photo by Brian Will our Virginia Cooperative Extension (VCE) Plant Clinics staffed by Master Gardeners. Three Plant Clinics are set up at libraries on week nights: Salem Church Branch, Porter Branch, and at the new library location in Spotsylvania Mall across from the Post Office. Four more Plant Clinic locations are outdoors on Saturdays at Farmers Markets: Hurkamp Park, Gordon Road (Commuter Lot), King George, and Stafford (near the hospital). Celebrate V i r g i n i a (neighborhood) off Route 17 also has one. Check the schedules on our website: mgacra.org (calendar page). Come with your questions; we have lots of information to share! “Lily of the Valley” We are pleased to welcome the twenty people who trained in Fall 2018 to become our next group of Extension Master Gardeners. Many have already begun their volunteer work by helping establish Cedell Brooks Jr. Native Plant Demonstration Garden in King George. Several shared that they enjoy interacting with the public and, coupled with a love for gardening and desire to increase their horticultural knowledge, the Master Gardener training was a natural fit. To reinforce what they learned each one had to do a research project on a particular topic. Nancy Bevilacqua chose to study Cottony Maple Scale, Lisa Ellis researched the Hemlock Wooly Adelgid, Raymond Polcha wrote an Ode to Boxwood because of the Boxwood Blight, Mike DiSalvo chose to study Tomato Blossom End Rot, and Manon Dixon focused on Sooty Mold on Hollies. We welcome all of them! Tina Will has volunteered with MGACRA for 13 years and lives near Ferry Farm in Stafford County. Trail, and Fall Hill Ave/Baseball Trail. These well-planned avenues permit residents who live along the Fall Hill corridor, and adjoining neighborhoods all the way to historic downtown to transit to the new stadium on foot or bike. For some folks, traveling by bicycle may be the most attractive option, and bike racks will be provided at the stadium for bike parking. For others, walking (or jogging, roller blading, skateboarding) will be the preferred option. If you choose to begin your journey to the stadium on the River Heritage Trail, you will walk alongside the breathtaking beauty of the Falls of the Rappahannock. For those transiting via the Canal Path, you will experience the wide variety of wildlife that exists along the Rappahannock Canal. As you merge from either of these pathways onto the ‘Baseball Trail’, your adventure will continue up the route hiked by famous explorer John Smith over 400 years ago to investigate a westward passage after his sturdy shallop boat was stymied by the rocky Falls of the Rappahannock. As you take the Baseball Trail up to the top of Fall Hill, you will pass by several housing complexes and the Sunshine Ball Park, and then cross over the Martin Luther King Memorial Bridge which spans I-95. The Baseball Trail will then take you past a few hotels where you will turn right onto walkways that will culminate a short distance further at the stadium. So for all you motivated baseball fans, and stadium event attendees who are physically able, we invite you to join Fredericksburg’s T4B movement, and invest in your personal health, your community’s strength, and the cleanliness of our local environment. On this simple journey on foot/bike to the stadium, you will burn calories that will make up for that delicious food and drink you will be taking in during the game. So be a team player, and tell your loved ones, ‘Take Me Out to the Ballgame’ along the Fredericksburg Trails! .Kevin Brown is the administrator of the "On the Fredericksburg Va Trails"
Growing up, my favorite part of the week was family dinner every Sunday. To this day, sitting down with my family on our back deck eating dinner, talking about our week, and listening to an old static radio is a staple in my childhood home. It was extra special in the summer when we harvested sour berries in our backyard to eat after dinner and collectively pretended that they were the best blackberries we had ever eaten. This hour of togetherness brought my family together and prompted us to have at least one homemade healthy meal a week. Downtown Greens’ monthly Youth Farm Program Family Dinners do the same: they combine sustainability, health, community, and education into a unified front for Fredericksburg youth. The dinners bring our young farmers’ families together and promote healthy living within every home. that they can bring home and share with friends and family. We hope that this experience inspires our youth to create food that promotes a healthy lifestyle and bring their family together. The Youth Farm Program is currently enrolling participants for the Summer of 2019. Our program is free of charge so children from all economic levels can join. If you have a 3rd, 4th, or 5th grader in your life and would like to sign them up for the Youth Farm Program this Summer, please contact: downtowngreens@gmail.com. Nicole Ziesing is the Youth Farm Program Intern at Downtown Greens. Photo by Jennifer Bangoura. By cecelia kirkman Good for You and the Environment! Are you looking for fresh produce that’s good for you and the environment? Then look for Certified Organic and Certified Naturally Grown (CNG) produce. In addition to healthy produce, both organic and naturally grown crops can have the added benefit of maintaining and improving soil and water quality, and conserving wetlands, woodlands, and wildlife. But what is the difference? In the U.S., “organic” is a regulated labeling term. It can only be applied to products or processes that comply with the USDA National Organic Program regulations. This government program primarily serves medium to large-scale agricultural operations. It also provides certification for businesses directly involved in food production, such as seed suppliers and food processors. USDA organic certification can be costly and burdensome, particularly for small-scale growers. Certification costs may range up to several thousand dollars. western and southern parts of the state. Blenheim Organic Gardens (www.blenheimorganicgardens.org), Colonial Beach, is the closest Certified Organic grower of vegetables, fruits and herbs. Blenheim supplies produce for the Fredericksburg Area CSA Project (FACSAP) and operates a “buyer’s club.” Fredericksburg is fortunate to have multiple CNG producers nearby. Downtown Greens (downtowngreens.org), Green Thumb Growers and Thumbs Up Bees, and Terra Stone Greens, LLC (www.terrastoneorganics.com) are located right in the city. Cardinal Apiaries (www.cardinalapiaries.com) calls Stafford County home. Guerra Gardens is located in Manassas, and Hartland Natural Farm (hartland.edu/farm) in Rapidan. All participate in FACSAP. Additionally, bees and honey can be purchased online from Cardinal Apiaries, and microgreens and lemongrass from Terra Stone Greens, LLC. Certified Organic or Certified Naturally Grown, either choice can be good for you and the environment. Learn more about seasonal “one-stop” shopping for Certified Organic and Certified Naturally Grown vegetables, fruit, herbs and honey with Fredericksburg Area CSA Project (www.fredericksburgcsa.com). Spring and Summer CSA shares now available. Cecelia Kirkman is a volunteer with the Fredericksburg Area CSA Project (FACSAP). Providing its first organicallygrown harvest in 1997, FACSAP is Fredericksburg’s oldest Community Supported Agriculture program. Suzy Woollam can always be found in The Scenter of Town on Charles Street. doesn't feel like a commitment. With Shirley, it is not a burden. She is my friend. She brings me such joy, more than I could ever bring her. I love her sense of humor, her quick wit." After some friendly arguing about who brings who the most joy, Shirley told me how important it is to be able to laugh, “There’s no sense in not laughing. You just have to laugh. If I had one wish it would not to be younger or live longer, it would be to have my eyes back so I can see my friends.” Shirley and Mary both shared how they simply enjoy talking with one another. However, they have had a few adventures going out to lunch and attending annual Senior Visitors Program gatherings. “Shirley especially loved the holiday party where we had a sing-a-long,” said Mary. “She loves to sing and loves music.” “Yes, I do,” said Shirley with a huge smile. “Mary also introduced me to Carl’s Ice Cream.” As we were getting ready to leave, Shirley’s personal care aide, Maria, shared her thoughts. “I really see the benefits of this program. Shirley always talks about Mary. I would like to encourage other care aides and families to refer their seniors to this program. You can just feel the special bond they have. Shirley really does think of Mary as her sister.” Shirley quickly responded, “Don’t advertise too much! I’m not sharing my Mary.” We left the way we came, with smiles and hugs. Jewell Wolterman 12225 Amos Lane, Ste 204 Fredericksburg, VA 22407 540-907-0574 www.elitetitleva.com jwolterman@elitetitleva.com Large or Small, I Sell Them All! Dreaming of Fabulous City Living? Let’s Make It Happen! Laurie Black is the Administrative Assistant for the Senior Visitors Program To learn more, call the Senior Visitors Program at (540) 371-2 2704 or visit our website at mhafred.org. Refer a senior or sign up to be a volunteer! The Senior Visitors Program is a free community service program of Mental Health America of Fredericksburg. this young group of hard working entrepreneurs becoming key players in the vibrant restaurant community of Fredericksburg. crevasses are thoroughly coated. Move the pecans to the bowl with the sugar mixture. With a clean spoon or spatula, gently fold the pecans through the sweet goodness until they are completely entrenched. Spread them evenly on a cookie sheet and put them in the oven. Every 15 minutes, pull them out and stir gently, rotating them so that all sides can toast ever-so slightly until one hour is reached or they are toasted enough for your taste. Cool and eat! When the guests arrived, Hal had no idea he was getting a treat. I warmed some of the pecans and put them on a fancy plate near where we were preparing the rest of the feast. It was a night for cheese crack (roasted garlic infused crème cheese on toast points); roasted bone marrow with shallot, parsley, lemon salt, on my – very first successful – homemade sourdough bread (Thanks Phillip for the tip on starting the mother!! ); butternut squash curry with chicken, peas, carrots, green beans, and corn served over black rice; and finally the crème brûlée with candied pecans tucked in the edges of the bowl cradling the crème. The pecans served three purposes that night: appetizer, desert, and doing something nice for a great guy! These are so easy, I doubled the recipe so I could send Hal with some and still have a quart left over. When you need an easy gift for a foodie with a sweet tooth, this recipe can easily fill the bill. Maybe next time we can talk about the roasted bone marrow? Who knows … As always, simple, easy, and delicious. Be well! Kyle treats us to simple, easy & delicious recipes each month in this space. wines, he Frappato balances the boldness of the Nero d'Avola. Lately, winemakers are recognizing the distinctive characteristics of the Frappato grape and single varietal wines are being produced. Join us for our Weekly Wine Tasting Saturdays. Food Co-op Happy Hour. Info on the Food Co-op and a chocolate contest. Everyone is welcome. 6-8 pm, Adventure Brewing, 33 Perchwood Dr Unit 101, . fredericksburgfoodcoop.com Sunken Well Trivia tonight starting at 7:45pm, 720 Littlepage, Open Mic at the Rec Center 8 pm . 213 William St.
Fredericksburg Photography Club welcomes new members. Meetings 7pm Dorothy Hart Center. "League of Earth's Angels - Meeting Howell Library Room #3. FXBG women's circle branch of the Global Sisterhood. FB page or our webpage at: https://520727.wixsite.com/leagueofearthsangels for more info. All women are welcome!" Sunken Well Trivia tonight starting at 7:45pm, 720 Littlepage, Open Mic at the Rec Center 8 pm .Scott Wagner hosts 213 William St.
Penny Parrish, "Idyllic Italy", Reception,Brush Stokes Gallery. Art for Park, skateboard art exhibit opening reception, PONSHOP, 712 Caroline St, 6-9pm. Join Women & Girls Fund members for our spring event 1000 WOMEN UMW Chandler Ballroom celebrating the 2019 grant recipients). Kyra Oliver, author of 8 Ways of Being, will share her journey and hard-earned tactics that can encourage us all to develop a positive mindset for living life with confidence. 6-9p Sunken Well Ladies Night 720 Littlepage, Ladies drink specials & $5 micro menu Live Music at 7:30 Kenmore Inn. featuring drink specials at the copper top bar. Open Mic at the Rec Ce hosts 213 William St.
Live Music at 7:30 Kenmore Inn. featuring drink specials at the copper top bar. rom 9am-2pm, $5 Bloody uegrass night from 7-9pm. eserve a table! special concert I Dream A g poetry set to musical BG Baptist Church. Eating for the Earth. Learn about plant-based cooking with a live demonstration, followed by a vegan potluck. Bring a dish to share or make a contribution to The Table. 5:30-7:30 pm, St. George's Episcopal Church, 905 Princess Anne St, Fredericksburg.fredericksburgfoodcoop.com Sunken Well Trivia tonight starting at 7:45pm, 720 Littlepage, Open Mic at the Rec Center 8 pm .Scott Wagner hosts 213 William St.
Washington Heritage Museums Annual Plant Sale, Mary Washington House. 9-Noon. sale features dozens of varieties of perennials including varieties from the gardens of the Washington Heritage Museums. All proceeds directly benefit the gardens. The gardens of Mary Washington House will be open and free to the public during regular museum hours throughout Garden Week. Our Colonial Revival garden peaks this time of year with tulips, iris and native columbine. Sunken Well Brunch from 9am-2pm, $5 Bloody Marys and Mimosas. Bluegrass night from 7-9pm. Usually a good idea to reserve a table! volume form, every Free Lance-Star newspaper from January 1933 to December 1969. Using the date provided, we searched the volumes, finding the picture with an article. These were men being sworn in to The Virginia Protective Force on March 13, 1941. The VPF was formed from an all-volunteer group of area men, some too old or too young for the draft, some not called due to various other reasons. A paragraph states; “Purpose of the company is to provide a force of trained men to render protective service in an emergency during the absence of the National Guard on active duty.” Their responsibilities included guarding the Falmouth Bridge, beginning December 12, 1941. At that time Rt. 1 was a major north/south route along the east coast. (Incidentally, The Heritage Center archives some photographs of VPF volunteer C. J. Pappandreou in uniform and with weapon, guarding the bridge); another duty was standing guard at the armory, which doubled as quarters for some of the men, or plane spotting from various rooftops. Looking through our database, we found numerous articles in the FL-S papers outlining other VPF activities. There are company rosters and lists of officers for the company, one being Captain Josiah P. Rowe, Jr. In all, there are about 20 articles found at the Center describing the VPF and their activities. There is so much more. John Reifenberg Retired from the National Park Service after 31 years of service. He has been volunteering at the Center since the fall of 2011. Upon the opening of hostilities after the bombardment of Fort Sumter in 1861, war would come to the quiet cities and towns of the South. When President Lincoln called for states to contribute troops to put down the rebellion, Southern state after state would leave the union. This would include Virginia, which seceded on April 17, 1861. Unpredictable to either side was the terrible loss in human lives and property which would befall both. In fact, over 750,000 troops would battle in the Fredericksburg and Spotsylvania area causing 100,000 casualties in a mere 18-m month period. This would leave our region decimated for years to come. Being halfway between the capitals of the North and South, Washington, DC, and Richmond, Virginia, naturally military attention was drawn here, and the warring armies would battle each other four major times between 1862 and 1864. The names of FREDERICKSBURG, CHANCELLORSVILLE, WILDERNESS and SPOTSYLVANIA COURTHOUSE would go down in history. entrance to Spotsylvania Battlefield on Brock Road west of Chancellorsville where Stonewall Jackson's epic flank march struck on May 2, 1863. Just last year, a 73.3-acre tract on the Spotsylvania Courthouse Battlefield known as Myer's Hill was acquired. By the end of 2018, CVBT had saved outright, or participated in protecting, over 1,300 acres of these four main battlefields in the Fredericksburg, Spotsylvania and Orange County area. One may ask, with this success and so much land preserved, why save anymore? When we look at the acreage of the entire conflict in this area, what has been saved pales in comparison. For instance, only 14 % of land has been preserved for the public out of the entire core battlefield acreage of 21,872 in Chancellorsville, Spotsylvania and Wilderness alone. The pace of development here, including roads, blacktop, concrete, shopping centers, and housing, has exceeded all expectations. These acres, once preserved, will, at some point, be some of the few green spaces left for the public to enjoy. The intent is to ultimately return these sites to their wartime appearance and provide access to the public for its enjoyment and historical interpretation for posterity. The battle to save more hallowed ground from the blade of the bulldozer continues. Please consider becoming an active partner and donate by contacting CVBT at P. O. Box 3417, Fredericksburg, VA 22402; (540) 374-0900, or visit the website at www.cvbt.org or email at execdirector@cvbt.org. Toby Keith was playing golf with Clint Eastwood at a charity tournament when Clint said he was turning 88 in a couple of days and was starting work on his new movie The Mule. Toby asked: “What keeps you going?” Clint replied: “I just get up every morning and go out and I don’t let the old man in.” Inspired by this simple phrase and Clint’s energy, Toby wrote the song “Don’t Let the Old Man In” for Clint who incorporated it into the movie The Mule. The song sends a powerful message about life and aging. Toby sings: “I knew all of my life that someday it would end. Get up and go outside, don’t let the old man in.” Don’t give up and don’t give in to the aches, pains, and negative age-related stereotypes. conducted by the Pew Research Center, the older people become, the younger they feel and the more likely they are to see “old age” as a time occurring later in life. Most adults over 50 feel at least 10 years younger than their actual age. One third of those between 65 and 74 said they felt 10-19 years younger. And, onesixth of people 75 and older said they felt 20 years younger. This study lends credence to the saying “you’re only as old as you think you are”. Feeling old is a state of mind more than a state of body. How you interpret your own aging is up to you. You can choose to have a positive attitude about growing older or a negative one. Research found that older adults whose view of aging is primarily positive live 7.5 years longer. Becca Levy, PhD, assistant professor of public health at Yale University found that older adults with more positive self-perceptions of aging lived 7.5 years longer than those with negative self-perceptions of aging. She also found that older adults exposed to positive stereotypes have significantly better memory and balance, whereas negative self-perceptions contributed to worse memory and feelings of worthlessness. Surprisingly, some studies found that older adults can inoculate themselves from internalizing negative stereotypes by not identifying with the category “elderly”. Because they feel younger than their age or more mentally active, these ageist stereotypes don’t apply to them. Not letting the old man in may have been Clint Eastwood’s way of inoculating himself from old age. Forget about how old you are in years. Instead, consider how old you feel or think you are. As Toby Keith sings in his song: “Ask yourself how old would you be if you didn’t know the day you were born?” Toby’s song also has these other thought-provoking stanzas: “can’t leave it up to him, he’s knocking on my door” and “look out your window and smile, don’t let the old man in.” So, when the old man comes knocking on your door, remember these powerful words in Toby’s song and don’t let him in. Karl Karch is a Gerontologist and local franchise owner of Home Instead Senior Care, a licensed home care organization providing personal care, companionship and home helper services in the Fredericksburg and Culpeper region. We live in a day and age where it is easy to feel disconnected from others, the earth, and even from ourselves. With technology all around and a breaking news story every day, our resilience can be tested, especially if we are not grounded. In order to maintain good health and wellbeing and to withstand the daily grind that life can throw at us, we must be grounded. Like trees, we need to be rooted to the earth to balance our lives and withstand our challenges. Staying grounded affects us physically, emotionally, mentally, and spiritually, and though I have written about it before (Front Porch, May 2017), I feel the need to offer a few more helpful techniques. Not knowing much about naturopathy, I was interested when the people from the Fredericksburg Food Coop told the “there’s a new naturopath in town.” This was my prompt to go visit Brian Keenan who moved to Fredericksburg just about a year ago and who now shares office space with chiropractor Christine Thompson in downtown Fredericksburg. Sitting in his consulting room, surrounded by jars of mysterious looking herbs and learned looking books, he plied me with tea made from hibiscus, damiana, orange peel, rose petal and “a pinch of liquorice” and explained how a naturopathy takes a holistic approach. It uses many different treatments but particularly focused on life style, diet and herbal supplements. His 1 hour initial appointment and 30 minute follow ups allow him to explore his patients in far more depth than the average allopathic doctor with their 10-15 minute appointments. With prompting for an example of how a naturopath deals with patients, he told me about a lady he treated who was getting out of an abusive relationship. She was anxious and couldn’t sleep, and was having migraines. On further probing he found she was a devout Catholic, but at this crucial time her religion had lost its spiritual support. Keenan’s choice for her was passionflower. “Partly because it’s a GABA agonist” (gamma-Amminobutyric acid is the chief inhibitory neurotransmitter in the brain, and supplementing it has a an anti-anxiety effect). “Partly because the early Christian missionaries saw structures in the flower as representing symbols of the last days of Jesus and the crucifixion and named it for the passion of Christ.” This Christian symbolism helped with the “resurrection” of this lady, who was able to sleep and whose migraines went away. Just Get Out of The Way A graduate of Bastyr University in Kenmore, WA, with an undergraduate degree in Herbal Sciences, then a doctorate in naturopathy which is “as rigorous a scientific training as a regular doctor” he explained, he is harnessing the bodies natural tendency. “If you get out the way, the body will heal itself” he notes. Getting out the way means identifying the things in the behavior, diet or environment that are making you ill and changing them. Possibly combined with some kind of supplement or therapy to help boost recovery. Having recently been introduced to the concept of functional medicine (read The Disease Delusion – Conquering the Causes of Chronic Illness for a Healthier, Longer, and Happier Life by Jeffery S. Bland, biochemist, who is “the father of functional medicine”) I am a believer in the idea that we need to look deeper than just the presenting illness. Much of the treatment in allopathic medicine is basically symptomatic. It often merely blocks one of the steps along the way rather than removing the cause of the illness. Non-steroidal anti-inflammatory medicines like ibuprofen or naproxen for example, block the prostaglandins that are released by the inflammatory process, and relieve the symptoms. But it doesn’t get to what’s causing the inflammation in the first place. Licensure Denial Naturopathy, is not recognized in Virginia at the moment – at least not for licensure. “Anyone can call themselves a naturopath or an ‘ND” warns Keenan, “so you have to make sure they trained at an accredited institution.” And likely many of the treatments with herbs, teas, diets, massage, exercise may sound a little outthere, but “I’m very evidence based” he notes – like when advising parents about the pro’s and con’s of immunizations for their kids. It seems to me anything that moves us toward a better understanding of why we get sick and goes to the root cause must only be a good influence on the medical field in general. So I hope the state licensing authorities will come to their senses. It’s always more fun in the Scenter of Town! 1875 to remove ingrown eyelashes, Electrolysis safely destroys the hair growth cells in order to prevent further growth. It can treat any area of the body except for the inside of the ears and nose, and can be combined with laser treatments, especially with skin types that laser is not as effective with. According to Heflin, there are milli-second bursts of heat with no burning effect and it is generally pain free, though the area may be a little tender afterward. She says that she has worked on clients that have actually slept through the process. A session is scheduled in 15minute increments up to an hour in length, with a 30-minute session being the average length. “My goal with Aries Eleven is to make a difference for others and ensure them that there is a permanent solution to the problems presented with unwanted hair,” Heflin said. Christina Ferber is a teacher and Eden Energy Medicine practitioner. She enjoys highlighting the fabulous people in our area that do what they can to make a difference in others lives. Celebration of Ceramic Art 3rd annual Sophia Street Pottery Throwdown For the third year in a row, on the second Saturday in June, Sophia Street in downtown Fredericksburg is the location of a celebration of ceramic art. The date this year is June 8th. Over 20 exhibitors will be set up to display and sell their pottery. In addition to being able to purchase the work of these artists, there will be demonstrations in wheel throwing as well as a tent set up with pottery wheels for the public to participate in a hands-on experience with clay and throwing on the wheel. There will be experienced helpers to guide and teach anyone who is interested in trying this. There will be live music, refreshments and event T-shirts for sale. A collaborative piece of pottery thrown by Dan Finnegan and decorated by Trista Chapman will be raffled with proceeds benefitting Empower House. Front Porch Magazine will be featuring potters in the May and June issues that will be exhibiting at the Throwdown with a short biography and photos of their work. and Virginia. Nealâ&#x20AC;&#x2122;s functional works are decorated using the ancient technique sgraffito (carving through one layer of clay to the layer beneath). His designs are inspired by nature and artists that have come before him. He currently works at this studio at LibertyTown Arts Workshop in downtown Fredericksburg, Virginia, where he also teaches. Trista Chapman: (above ) For the past 23 years Trista has been working with low-fire earthenware clay and a vibrant palette of underglazes. She creates and sells an original line of whimsical, colorful, functional as well as decorative pottery out of her studio and shop, Sophia Street Studios located in downtown Fredericksburg, Virginia. Christina Bendo: (top left) Christina graduated from the University of Mary Washington. She worked as a pottery assistant at Sophia Street Studios and additionally began her own studio practice as artist-in-residence at LibertyTown Arts Workshop in Fredericksburg, Virginia. She has since traveled afield for residencies in North Carolina, Maine and Hungary. She currently makes pots in the mountains of western North Carolina. Identify this mystery house and you could win a gift certificate from a downtown merchant. Here’s how: Email frntprch@aol.com, Subject: Mystery House, Identify house address, Your name, address, email. The poem below is a hint of the location of the mystery house. Good Luck! visionary abstraction. Eventually the former Fredericksburg art teacher included a broader scope from here and now to life and emotions; seeing all of these ideas through circles. "Everywhere we went," she says, "I saw portholes." Herndon, who is one of the original founding members of Art First adds, "I would like the viewer to see these as a kind of "tunnel vision" that makes you focus either on my subject or on your interpretation. Hopefully a connection will make you come full circle." Cathy's serious interest in primitive cultures and folk art can be noted as she uses a 21st century context with diverse materials such as neon lights, assemblage, paint and mixed media. Murals, jewelry and sculpture are also a large part of her art making. “Portholes Four” Fredericksburg Schwetzingen Italy, Germany Alliance. FredericksburgKathmandu Exchange and Fredericksburg/Frejus, France Sister City. “TULIP TIME” by Penny A. Parrish 810 Artists: Beverley Coates, Watercolorist Penny A. Parrish, Photographer; Lynn Abbott, Oil Painter Daily 10 to 6.
tour with Actor and Eagle Scout Ryan Anderson, who plays Black Stache in “Peter and the Starcatcher.” Groups will get a rare perspective of what it’s like beyond the stage and experience the many components necessary to create a production. There will also be the opportunity for groups to select theater games and question-and-answer sessions with the cast and crew. Lenora Kruk-Mullanaphy, who is the president of Kruk Mullanaphy Media Group, is a public relations professional and freelance writer. 2019 Virginia High School League State Theatre Champions ‘The Stafford Players’ to Present ‘Peter and the Starcatcher’ at Stafford High School April 26-2 27 and May 2-4 4 thestaffordplayers@gmail.com. your rabbit’s reach. Rabbits love to chew! Be sure to provide your rabbit with lots of toys to chew. A good cardboard box castle is perfect for them to chew on, fun to make and offers hours of entertainment for your rabbit. A rabbit’s diet mainly consists of fresh hay which should be given daily. Baby rabbits should eat alfalfa hay and adult rabbits should be fed Timothy hay. Supplement your rabbit’s hay diet with fresh vegetables, fiber-rich pellets and fresh water. Remember to limit the quantity of pellets you give to adult rabbits. For those with a Green thumb, planting a garden for your rabbits is a great idea. Plant herbs such as basil, parsley and mint which they just love! The one advantage rabbits have as pets is that they can be litter-ttrained since they use the bathroom in one area. Place a litter box near the food/water/hay feeder. Rabbits like to eat hay and use the bathroom at the same time, so placing the hay in the litter box will promote good bathroom habits. Recycled newspaper litter is best as clumping litter is not recommended. My 2 Lionhead bunnies, Bun Bun and Smokey Hare are a joy! I sit in my office in the mornings and watch them run and jump around feeling so happy. I think free roaming rabbits are the best. But I do realize that caring for my bunnies takes time and effort. They love to see me coming and greet me with lots of snuggles. If you are thinking of getting a rabbit, trust me, you won’t regret it. indoor/Outdoor Pictures Art galleries along the street exhibit so many fine paintings: an abstract with gold veneer, still-life of chrysanthemums, or a boy and girl playing tag. I treasure every one of them because the images they yield are a rapture that sight gives transfixing their brushstrokes through the mind of perception. Then I continue elsewhere and glance around under April-sky to regard the luminous montage of children bearing backbacks\ and a townscape coming alive Picture shown indoor and out become elegance offered to us. Frank Fratoe lives & writes in the city.in loves. psychology and mysticism can work together to interpret our human experience and can help us navigate this meaningful and rich landscape that is our lives. Now, here are some astrological happenings for April 2019: The Sun will enter Taurus on the 21st: Sun and Uranus will be within 2 degrees, making for a good time to prepare for changes in what we value or how we value (money, earth, possessions). New Moon in Aries on the 5th : A time to go deeply within and reflect upon how we initiate things, our courage, and how we use our personal power to bring about something new evolving Full Moon in Libra on the 19th: A time to celebrate peace, focus on the gifts our relationships bring, look at how balance plays a part in our daily lives Jupiter retrograde April 10 to August 11: Jupiter is the planet of expansion, higher education and distant travel. This is a good time to reflect upon opportunities to take classes or learn something new, re-examine values or our relationship with spiritual matters. Saturn retrograde April 30 to September 18: Saturn is about structure and long-term plans. This is a good time to examine career goals. This time can also bring about an awareness of our responsibilities and a period of making plans around the limitations those responsibilities bring. Ask Yourself These 2 Questions Every Morning to Have Game-Changing Days First Question. As soon as you wake up, ask yourself, "What do I value the most today?" Thinking this way helps direct you toward your biggest priority for the day ahead. Maybe it's a work project, time with loved ones, or just rest, but every day, choose what you want to put first. So often, it's tempting to focus on what we don't desire throughout our day. We might think, I really don't want to have a headache right now, or I don't want to be running late. But when we find ourselves getting stuck on what we don't want, that can become an opportunity for us to decide what's truly important. If you catch yourself thinking of all the things you don't want to happen, ask yourself what type of values are important instead. What do you want to focus on today? Going "Downtown," isn't just shopping , it is an expedition. It can turn into unexpected mind trips, side trips, food trips, actually fun, even an adventure or two. With our busy lives,we need to give ourselves a break, and downtown is the place. Become a "Townie," for a moment, jazz up your life, bump into friends, meet new friends, even a tourist or two, who are always so eager and friendly. They are vacationing and are always so happy to get some tips on how to get the most from their trip, as in food tips, interesting places to visit, even a friendship, brief (maybe not) though it may be. They love to take real stories back home with them, straight from the lips of the native Fredericksburgers. If you live here or out in the counties, put downtown on your list of enriching experiences, bring the kids, my grandson loves the antique shops. Walking into the Blue Shark Antique store, (not one, but two large shops) meeting the owner, surprised me, as antique stores are often dark and crowded, making it difficult walking through the cluttered aisles. The Blue Shark is so light, so organized, spotlessly clean and shiny. I thought I was in a library, a school, or a historical home, as the interior so attractive and inviting. Mark Repass, whose wife is a teacher, and his mom and dad, own and run the Blue Shark. They are all active in the business. Mark likes among other items, hunting and fishing antiques, toys and military items, vinyl music albums. I spotted a beautiful, 1947 prop driven toy airplane I thought was in amazing.condition. Mark said the most enjoyable part of his work is the anticipation. When going to the shows, and auctions, he never knows what interesting antique he may find, the monetary value is not important. For instance, Mark went to an auction and ran across chest of drawers. Inside a secret drawer were personal papers, and newspapers, which was so very interesting. He usually goes to auctions in Virginia, N.Carolina, the Midwest, and Ohio. Mark is not a suit and tie guy, and likes the freedom to create a unique life and his environment. Besides his mom and dad here in Fredericksburg, the person who influenced Mark and his love of history was John (J.D.) Sinn, a neighbor, who had a metal detector. Mark developed his love of history and antiques as he grew up helping J.D. find old bullets, and artifacts. Mark loves Fredericksburg, tho he was born in Iowa. He got his first job as a golf cart boy at the beautiful, Shannon Green Golf Club. He remembers the beauty of the property we now know know as the multi-store, asphalted, Central Park. Mark appreciates downtown Fredericksburg, and that he sees people he knows everyday. He enjoys the fact that he has the opportunity to meet so many new people and tourists who visit his store. He loves the Southern hospitality that abounds in Fredericksburg, and that his family has passed their business down through the generations. Come visit The Blue Shark, (see the magnificent shark above the store) across from Goolricks Pharmacy on Caroline St. This Gal Around Town, shops downtown exclusively, loving the ease of parking in front of stores, the nicest shop owners, interesting stores, quality goods and the bike parking is pretty good too! Love the friendly dog dishes, too. I would like to tell Fredericksburg City, more bike racks would be handy.